If you've ever been stumped by an engineering problem on the job, yet wanted to avoid the expense of hiring a qualified engineer, you should have this book. Here you'll find engineering principles explained in non-technical language and practical methods for applying them on the job. You'll learn understand engineering functions in the plans and how to meet the requirements, how to get permits issued without the help of an engineer, and anticipate requirements for concrete, steel, wood and masonry. See why you sometimes have to hire an engineer and what you can undertake yourself: surveying, concrete, lumber loads and stresses, steel, masonry, plumbing, and HVAC systems. If you've ever been stumped by an engineering problem on the job, yet wanted to avoid the expense of hiring a qualified engineer, you should have this book. Here you'll find engineering principles explained in non-technical language and practical methods for applying them on the job. With the help of this book you'll be able to understand engineering functions in the plans and how to meet the requirements, how to get permits issued without the help of an engineer, and anticipate requirements for concrete, steel, wood and masonry. See why you sometimes have to hire an engineer and what you can undertake yourself: surveying, concrete, lumber loads and stresses, steel, masonry, plumbing, and HVAC systems. This book is designed to help the builder save money by understanding engineering principles that you can incorporate into the jobs you bid. Permits and Engineering This book is about engineering. But it's not written for licensed professional engineers. It's written for construction contractors, subcontractors, tradesmen, estimators, designers and even building owners. In short, it's for anyone who has to deal with engineering problems in construction - and I suspect that's just about everyone in the construction industry. Engineering is as much a part of construction today as lumber or concrete, steel or wire. In practice, there's no way to avoid engineering issues when building almost anything today. Modern building codes have forced us all to be conscious of good engineering practice, no matter what or where we build. True, engineering is a specialty that requires specialized knowledge - and lots of it. If you've picked up this book in hopes that it will make you a competent professional engineer, be forewarned. This isn't a training manual for the state license exam. And it certainly isn't a substitute for a four-year college degree. It's something entirely different, but I hope just as valuable to most contractors, builders, and construction professionals. This book explains in non-technical language the principles engineers use when planning construction projects. You might ask, "Why do I need to know this? Isn't it enough just to hire an engineer when I need one? I'll never be able to stamp the plans with an engineer's seal to get them approved by my building department. So what's the use? Why bother learning anything about engineering?" The answer is that engineering can be a valuable skill for anyone in the construction industry - like driving a straight nail, reading plans, or estimating costs. The more skills and knowledge you have, the more valuable you are to your customers or your employer. By the time you finish this chapter, I suspect you'll begin to understand how valuable a knowledge of engineering principles can be in your job - even if you're not a licensed professional engineer. recognize and follow accepted standards for all concrete, steel, wood, and masonry construction. But please don't think of this book as a substitute for the building code. It's not. You'll still need a copy of the building code that applies at your construction site. The code is an ordinance adopted by your city or county or state, and enforced by your local building department. The code enforcement office in your community may be called the Department of Inspection Services, Department of Engineering, Department of Public Safety, Housing and Development Administration, Building Department, or some similar name. But the function is the same - to make sure all building done in that community is done according to code. Another type of code covers construction work in the community's public areas, which usually includes sewer connections, driveways, and curb and street work. It's probably called the Specifications for Public Work Construction and Standard Plans for Public Work Construction, or some name like that. The Department of Public Works, rather than the Building Department, controls the plan checking, permit issuance and inspections for public work. International Conference of Building Officials (ICBO) located at 5360 South Workman Mill Road, Whittier, CA 90601-2298 (Phone 310-699-0541), who publish the Uniform Building Code (UBC). Building Officials & Code Administrators International, Inc. who publish the BOCA National Building Code. Their address is 4051 West Flossmoor Road, Country Club Hills, IL 60477-5795 (Phone 312-799-2300). Southern Building Code Congress International, Inc. who publish the Standard Building Code. Their address is 900 Montclair Road, Birmingham, AL 35213 (Phone 205-591-1853). The ICBO Uniform Building Code is probably the most popular. It's used in most states west of the Mississippi and many Canadian provinces. The BOCA code is used in most communities east of the Mississippi except in the Southeast, where the Standard Building Code is the more common code. Why, you might ask, are there three model codes? Isn't one enough? The answer is, yes, one model code would be enough. What's good building practice in Florida should be as good in Oregon as it is in New Jersey. But there are three organizations writing codes and all three believe their approach is best for their purposes. In fact, the differences between the codes are growing smaller and smaller as time passes. Eventually we'll probably see a merger of the three model codes into one. But don't hold your breath. Any city or county government could write their own code rather than adopting one of the model codes. Of course, some do. But most adopt one of the model codes because adopting a code written by someone else is easier than writing your own. And it's a good thing government is a little lazy here. Otherwise every community would have its own code. A builder working in a dozen different cities would have to learn a dozen different building codes. If you've been in construction for a while, you understand how hard it is to learn one code. Imagine having to deal with twelve different codes! But be aware that every city and county that adopts a model code is free to make all the changes, additions, and deletions they want. In fact, they're free to adopt any code they want, even one that's six years old. And some do. It's not safe to assume that your city and county have adopted the current version of some code without amendment. They probably haven't. The only way to be sure you've got the right code is to buy a copy (with all amendments) and keep it up to date. As an example, the County of Los Angeles 1996 Building Code adopted by reference portions of the 1994 edition of the Uniform Building Code, Volumes 1 and 2. So where do you get the code? That's a real problem. Each of the three model code organizations will sell you their current code. Just call and ask for a price list. But that isn't necessarily the same code your community is using. Remember, your city or county probably added, deleted, and made changes when they adopted the code. That complicates the problem. And if you'll let me get up on my soapbox for a minute, I'd like to offer my perspective on this important issue. The code is a law. True, ignorance of the law is no excuse. But laws are made to be complied with, not as a means of trapping the unwary. Code compliance isn't a guessing game played between you and the inspector. It's a cooperative effort following established rules to protect lives and property. A building department that's really interested in helping contractors and builders follow the code (rather than just punishing them for failure to comply) should sell the complete, current code at a reasonable cost to anyone who wants it. If this isn't possible, they should advise the public where to get the code and amendments. In many cases, building codes can be purchased from the code's publisher, a technical book store, or from one of the mail order companies that handle construction publications. Amendments to the code, in pamphlet form, are sold by the building departments. I suspect that some younger, less-experienced inspectors would prefer that contractors and builders didn't have the code. From their perspective, contractors who can read and understand the code just make problems for building inspectors. That misses the point. Here's why. Ours is a government of laws, not men. No building inspector has the right to demand any more than the building code requires. The only authority inspectors and building departments have comes out of the code. If it isn't in The Book, you don't have to do it. Inspectors know that. Some novice inspectors might prefer that contractors didn't know that. They don't want to argue with builders over code language. They don't want to see contractors studying the code. That just means trouble. But older, more-experienced hands in the building department usually see it differently. They know the best way to avoid arguments: Help contractors and builders master the code. That way they do it right the first time, before an inspector ever gets involved. That makes an inspector's life lots easier. And what's the best way to help contractors master the code? By putting a copy of The Book in the hands of every builder who wants one. Maybe that's why more and more building departments are selling the code right across the counter. It's something you should encourage. Remember though, the building official usually has the power to interpret the code based on its intent and purpose. If you still have a disagreement with the inspector which can't be resolved, you can file an appeal with the Board of Appeals of the Building Commission. Treat the inspector in an intelligent business-like manner - and expect the same treatment from the inspector. You should both be courteous and friendly without becoming too personal. And above all, don't argue. Of course, the code isn't easy to understand. It's written to be enforced (like a law) rather than be understood (like a road map). Every building code has exceptions within exclusions within variances. They aren't very well organized. Indexing is poor. But you can understand it with a little study. If you're having trouble mastering the Uniform Building Code, I can recommend Contractor's Guide to the Building Code by Jack Hageman. It's published by Craftsman, the same company that published this manual. An order form is bound into the last few pages of this book. Remember that building codes set minimum standards for safeguarding life, health, and property. You can always exceed code standards. That's fine. Just don't get caught doing less than the code requires. All building codes are based on experience. As we learn more about construction, construction materials and building hazards, codes change. As new products come on the market, codes change. Any time a building defect results in a major loss of life, codes change. It's safe to assume there will always be changes in the building code. It's safe to assume that the code will become more and more complex. And my guess is that engineering principles will become more and more important to all contractors and builders. Maybe that's the best reason for reading the rest of this book and keeping it handy for future reference. Building permits are required in nearly all communities now. The penalty for starting work before a permit is issued is usually a doubling of the permit fee. In addition, an investigation fee may be charged. But what's most important is the fact that building without a permit is a violation of the law. The building department may issue a stop order to discontinue use of the building and to vacate the premises. The permit is an authorization to begin work. It also serves as a public record, a public notice, a plan checklist, a statistical record, an inspection record, and a receipt. It provides general information to the permittee (the person or company receiving the permit) and the public. Although the building plans may be destroyed after some time, the permit form is usually kept on file indefinitely. The value of the work includes all fixed equipment required to operate and use the proposed building. The evaluation stated on the building permit application may be used by the local governmental appraiser to set the tax value of the property. An application for a grading permit needs topographic plans showing existing and proposed contour lines and drainage devices. The grading department may also require a surety bond in an amount that will cover the entire project. The application will describe how much earth is to be moved, because this determines the permit fee and the amount of the bond. Grading permits are usually required for earthworm cuts that are in excess of 5 feet and fill over 3 feet in vertical depth at the deepest point. Permits are required when earthworm is over 50 cubic yards of cut or fill. You don't need a permit for any portable ventilating equipment, comfort cooling units, and similar movable equipment. Make sure the type of construction you plan is legal under the zoning ordinance that applies. Zones are set by the planning or zoning departments which regulate the location of trades and industries. Zoning ordinances limit the ways a building can be used and identify where it can be located on the property. You'll need a building permit for all construction work that will cost over a certain amount, usually $200. You'll need separate permits for each building, even though they're on the same lot. An exception is made for auxiliary buildings, such as a garage. Building permits are required for all construction that affects a building's structural stability. The permit process is a means of enforcing the building code to provide better construction and greater safety to the public. The application for the permit requires a legal description of the site, a description of the work, and identification of the parties involved with the work. Plot plan showing lot dimensions, streets, location of all existing and proposed buildings, use, number of stories, and type of construction of each building. 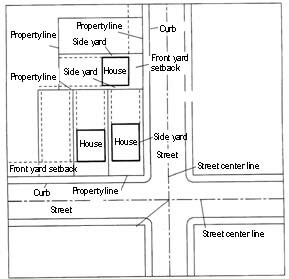 Figure 1-1 is a vicinity map showing front and side yard setbacks of several contiguous lots. Foundation plan showing dimensions, locations, and details, pier and crawl space openings, sizes, s, and spacing of girders and joists for raised floors. Floor plan showing all rooms, windows, doors, and building security. Location and sizes of windows, doors, stairways, use of rooms and plumbing fixtures. Two or more exterior elevations of the building showing roofing material and slope, location of doors and windows, and attic ventilation. Grade elevations around a building will determine the number of stories. Figure 1-2 shows the difference between a basement and a cellar. Construction details which identify the materials you intend to use and the insulation that will be applied to the walls, ceilings, and roof. Figure 1-3 shows simplified construction details for a residential addition. Specifications which identify the grade and type of materials to be used for structural parts of the building. A building official may waive the requirements for plans and calculations if the work doesn't seem to need them. Some building departments don't require structural calculations when the proposed residential building complies with the code's Type V construction requirements. If there's doubt about the validity of what your plans show, the building official is going to ask for some help. At your expense, of course. You'll have to submit engineering calculations or the opinion of a responsible person that the plans meet generally-accepted engineering standards. These plans should be prepared under the direct supervision of a licensed engineer and must be signed by that engineer (and usually include a registration seal granted by your state and its expiration date). Inspections are made periodically during the course of construction. They are made before each major stage of the work is concealed. Inspections are called or special. Called inspections on wood framed buildings are made on foundations, wood framing, ventilation, insulation, and plaster. Other called inspections are for reinforced concrete or masonry, structural steel, electrical, plumbing, heating, and refrigeration. Final inspection is made at the completion of all work. Special inspection is usually provided by the owner of the building. Figure 1-4 is a copy of a typical Building Department Inspection Record. It shows the inspections performed during the course of construction. Larger projects may need separate permits for grading, plumbing, electrical, and mechanical work. Figure 1-5 shows an elevation view of a six-story building which would usually need separate permits. Contractors doing specialty work usually submit plans covering the work they intend to do. In some communities, you'll need separate plumbing, electrical, and HVAC plans and specifications for an apartment building that's 15,000 square feet or more. Even if the plans are drawn by the subcontractor who will do the work, the building department may want the plans approved by an engineer licensed to prepare plans for that type of work. In some states, a licensed contractor who installs electrical or mechanical systems can prepare plans for that work. But the electrical or mechanical contractor may not design work that will be installed by another contractor. Figure 1-6 outlines the procedure that may be required to get a permit issued for a larger building. Obviously, it can be complex. Plan approval can take months or even a year for a larger commercial or industrial buildings in some communities - even when the building department isn't flooded with applications. The code regulates the occupancy, or intended use, of buildings by their size and type of construction. It also controls the type of building construction based on the size and use. The purpose is to limit the size of buildings that are vulnerable to fire or that have many occupants. When the contents of a building are hazardous, its construction must be more fire resistant. These classifications may vary somewhat in different codes. Each of these groups is further divided into different levels of hazard. This book considers only Group B and Group R. A B-1 occupancy includes repair garages while B-2 includes almost all types of stores, restaurants, and workshops. Group R- I covers apartment houses and hotels while R-3 includes dwellings. Types of construction are classified by the fire-resistive properties of the major elements of a building. These include the structural frame, walls, ceilings, floors, and roofs. Type I construction is the most fire-resistive while Type V is the least. The terms that describe how a building will react to a fire are combustible, non-combustible, fire-resistive, and not fire-resistive. The words protected and non-protected may be used in place of the last two terms. For example, a wood frame structure is combustible while a steel frame one is non-combustible. A coat of plaster over a wood or steel beam provides some fire-resistive protection. The degree of protection is based on the time required for a fire to weaken the member. Typically, fire-resistance may be one, two, three, or four-hour protection. Various thicknesses of coatings produce different degrees of fire-resistance. Fireproof coatings may be of gypsum or portland cement, or similar mineral materials. This is the most fire resistant construction. Frames are non-combustible with three-hour fire-resistive protection. In some areas, buildings made using this type of construction are called Class A buildings. Frames are combustible with one-hour or no fire resistive protection. Frames are combustible, but made of heavy timbers which are slow to bum. These are the most vulnerable to fire. Frames are made of combustible light wood framing, with one-hour or no fire-resistive protection. Figure 1-7 shows the fire-resistive requirements (in hours) for different types of construction. A building area is considered to be the area within the exterior walls of a building exclusive of vent shafts and cores. The allowable area and height of a building increases with the more fire-resistant types of construction. For example, a six-story apartment building like the one in Figure 1-5 must have Type I or II fire-resistive construction. A one-story apartment building with Type VI -hour construction can have a basic area of 10,500 square feet. For multiple stories, the total allowable area may be increased to 200 percent of the basic allowable area, or 21,000 square feet. You can increase this even more by planning wider yards around the building or by adding automatic fire sprinklers. For property located in a relatively low-density area, the code may permit a larger building area. Figures 1-8 to 1-13 show permit forms similar to those used in many building department offices. Notice that forms include applications for buildings, demolition, grading, plumbing, and electrical work. No permit will be issued until several departments at city hall have had a chance to review your plans. Figure 1-14 is a list of departments that may review your plans, and what they'll be looking for. Additional permits may be required for building security, accessibility for the handicapped, and energy conservation. Permits may also be required by state safety agencies for hazardous work such as asbestos removal and high rise scaffolding. Unfortunately, the foregoing list may not be complete. Other public agencies may have the right to review your plans and hold up issuance of the permit until you've met their conditions. No wonder getting a permit issued can take a year! The term engineer is sometimes used for salespeople, service technicians, and maintenance workers to add dignity to their job titles or imply education and experience. For example, people driving trash collection trucks may refer to themselves as "sanitary engineers." That's fine with me. But I'm going to use the term in a narrower sense. People become engineers when they're licensed by a government agency to provide engineering services to the public. Of course, there are many types of engineers. Figure 1-15 lists some of the common engineering professions and their areas of expertise in building construction. The National Council of Engineering Examiners (NCEE) defines an engineer as a person with special knowledge, education, and experience in mathematics, physics, engineering sciences, and methods of engineering analysis and design. The NCEE also says that a professional engineer is an engineering specialist who is registered and licensed as a professional engineer. Some professional engineering specialists working in construction are: civil engineers, soils engineers, engineering geologists, structural engineers, mechanical engineers, electrical engineers, and land surveyors. Here are descriptions of some engineering professions and their work. This is probably the oldest engineering profession. It includes design and supervision for constructing foundations, framed structures, and buildings. It covers all studies and activities connected with fixed water works, water supply, waterways, and harbors. This field developed from civil engineering. A soils engineer investigates proposed building foundations and site grading for housing, industry, and municipal improvements. In some states, a soils engineer must be a registered civil engineer. A structural engineer is usually a registered civil engineer who is specially qualified in structural engineering. He or she investigates and designs force-resistant and load-supporting structural members. These may be foundations, walls, beams, columns, trusses, and other framing portions of buildings and structures. Mechanical engineers belong to a broad profession which takes in many specialties. In building construction, mechanical engineers plan the heating, ventilating, refrigeration, air conditioning, and plumbing systems. An electrical engineer designs and supervises the electrical services and wiring in construction projects. This includes illumination, protective devices, instrumentation, control, electrical machinery, and communication. The architect is the prime professional on many large building projects who plans and designs buildings, identifies construction problems, and gathers background information. He or she evaluates this information and creates a design that satisfies the client's requirements. The architect prepares plans, specifications, and other contract documents for the builder and craft subcontractors. As the prime professional, the architect coordinates the engineering consultants on the project. Although the building official (head of the building department) may let an architectural firm accept responsibility for all engineering work on a project, in practice each engineering specialist is responsible for his or her own specialty. The UBC, BOCA, and SBCCI don't identify exactly when an engineer is, or isn't, required. Under the code, that's largely up to the chief building official at your local building department. Of course, most building departments prefer to be cautious, sometimes especially cautious. Suits against cities for negligence by their building departments have become very common. All civil engineering plans, specifications, reports, or documents shall be prepared by a registered civil engineer or by a subordinate employee under his direction, and shall be signed by him to indicate his responsibility for them. Many states have similar requirements for preparing electrical and mechanical engineering plans, specifications, reports, and documents. Any method or system of construction to be used shall be based on a rational analysis in accordance with well established principles of mechanics. The code may say that sufficient strength must be demonstrated by structural calculations, or that energy calculations prepared by a professional engineer are required for habitable buildings. When you need the opinion of an engineer to get a permit issued, it's a good idea to file a written record of the computations which justify the design. And each drawing sheet and written record of computation should be signed by, or bear the approved stamp of, an engineer or architect licensed in the state for the type of service performed. Many larger cities require a licensed structural engineer to sign plans for buildings over 160 feet in height. Some cities take another approach. They may not require the signature of a registered engineer or architect on structures that require some structural design. But the person responsible for the design may be required to make engineering calculations and sign those calculations and the sheets of the plans which show those details. masonry and concrete retaining walls under 4 feet in height. Before building on any lot, it's good practice to have a licensed land surveyor mark the lot corners. The surveyor can also make a topographic survey which shows the contours of the land and precise location of any existing buildings or other improvements. If the land has to be split or subdivided, get a land surveyor or civil engineer to survey, document, and record the subdivision. Don't build before you have the survey. After the property boundaries are established, it's O.K. to have construction layout done by someone who's unlicensed but trained to do that type of surveying. Chapter 2 discusses this type of field engineering in depth. When Do You Need a Civil or Structural Engineer? Building department regulations may identify when a civil or structural engineer is required. The more risk, the more complicated the construction, the more likely an engineer will be required. In some offices, any building with a beam over a certain length or retaining wall over a certain height will require an engineer's approval. In structures where high-strength concrete, masonry, or welding are called for, a registered engineer may be required to issue a certificate of compliance when work is completed. This document certifies that the work was done according to the plans. This normally happens when plans call for concrete having a compressive strength over 2000 psi. Standard strength concrete has a minimum compressive strength of 2000 psi. All concrete stronger that this is considered to be high strength concrete. You may also need an engineer's certificate when the design calls for full-strength masonry or welding. Without this certificate, the design may have to be based on one-half of the maximum allowable strength of the masonry or welding. This may mean that the size of weld or the amount of steel reinforcing must be increased. On jobs involving prestressed concrete construction, some codes say that the completed work must be certified by a licensed civil or structural engineer. Normally a civil engineer must design and supervise all construction work within public property (public roads, driveways, water supply, and sewage systems). So any portion of a project that's at least partly on public property, or is to be dedicated to the public, needs a civil engineer. Since the recent California earthquakes, certain construction jobs within Seismic Zones 3 and 4 need a civil or structural engineer to check the structure during construction. These jobs include constructing essential or hazardous facilities, and buildings with habitable rooms that are over 75 feet above grade. The engineer must visit the site to make sure the approved structural drawings are followed. At job completion, he or she has to submit a statement in writing to the building department certifying compliance. If there is any doubt about the safety of an existing structure, the building official may order a structural investigation by analysis, load test, or both. When Do You Need Soils Engineers and Engineering Geologists? Initial inspection: before any grading or brush clearing is started. Toe inspection: after natural ground is exposed and prepared to receive fill, but before any fill is placed. Excavation inspection: after excavation is started, but before the vertical height of lifts or layers exceeds 10 feet. Drainage device inspection: after forms for drainage devices and pipe are in place, but before any concrete is placed. Rough grading inspection: when all rough grading has been completed. Final inspection: when all work has been completed. the total volume of earth you need to cut or fill is more than 50 cubic yards. A soils engineer or engineering geologist should certify the safety of cut or fill slopes that are steeper than 2:1 (horizontal to vertical). In summary, construction and engineering are dynamic fields. The building codes change all the time. Codes are revised and upgraded as new experience and knowledge are acquired. Catastrophic earthquakes, floods, and tornadoes result in new subjects being added to the UBC, BOCA, and SBCCI. Some of these revisions include seismic and seismic-isolated structures, flood-resistant construction, construction in high-wind areas, and freezing and thawing conditions. The following chapters contain tables and charts used for rule-of-thumb design and as checklists for building construction. There are simple methods for sizing foundations, concrete, and wood and steel structural members. There are also basic rules for sizing plumbing and heating, ventilating, and air-conditioning systems. Still hesitating? Take a look inside. Instead of page after page of mathematical equations and formulas, you'll find a wealth of explanations, illustrations, charts, tables and diagrams. Plus some handy checklists that will help keep your jobs organized and on schedule. This is information anyone in construction can use. Max Schwartz has been in the construction business for over 50 years, working jobs from small residential developments to major industrial facilities, in locations ranging from California townsites to the Central American jungles. Since serving in the Army Corps of Engineers in World War II, he has been a consulting civil and mechanical engineer, licensed in states across the country. He has lectured and written several books on building engineering, and has taught civil engineering at UCLA Extension for the past 20 years. Mr. Schwartz now specializes in forensic engineering and serves as an expert witness in proceedings involving building defects and catastrophes.